There are 4 main types of email that you receive every day. 1. Important emails that you need to read and respond to immediately. This includes things like new client inquiries, current client correspondence, new online orders placed by your clients, some reminders and some personal emails. 2. Less important emails that you need to read and respond to. This includes things like questions from colleagues, requests from other vendors, some reminders and some personal emails. 3. Emails that you want to read but do not have to be read immediately and may or may not require a response. For example, my email newsletter (sign up at the top right of this page) is a great way to make sure you see every post here that helps you grow your business, but you don’t need to read it right away or respond to it immediately. 4. Emails you don’t want at all. This would include things you’ve signed up for in the past that you no longer read, unsolicited emails, and spam. Thankfully, Gmail does an absolutely wonderful job at eliminating spam so that you rarely if ever see it. I think I end up with only 4-5 emails all year that land in my inbox that are actually spam. It’s incredible. Start thinking about where you’d categorize the various emails you receive each day. We’ll use this information in tomorrow’s post to start filtering out everything in groups 3 and 4 so that you can focus on the things that really need to be done without distraction. There’s several extra super-useful tools available for use with Gmail that need to be enabled to really rock your inbox, so we’re going to get that set up right now. Click on the Settings button at the top of the page, and select “Settings” (which is also called “Mail Settings” in other places). Multiple Inboxes – Lets you use more than one inbox, which we’ll discuss in part 4 of this series. Canned Responses – Saves emails for you to use again and again. We’ll discuss this more in part 5 of the series. Undo Send – This one lets you undo your send for a few moments after hitting the send button. Useful if you forget to attach a document and realize it right away, etc. Send & Archive – Automatically archive the email when you send a response to someone. Super useful for keeping your inbox clean. I need to use this button more. Insert Images – Puts the image into your email body instead of just attaching it. Nice feature to have, but not necessary. There’s lots of other useful things here, so take a peek at them and enable any others that you think would be helpful. Once you’ve enabled them, MAKE SURE TO CLICK SAVE at the bottom or none of them will be saved. I’ve found that sometimes the save button won’t let you click it, but if you move to a different settings tab at the top of the page and click “save” at the bottom of that page, it still saves your settings. Annoying, but not a big deal. 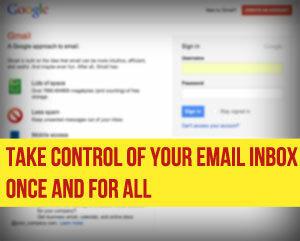 Once you’ve done this, head to part 4 where we watch our email organize itself. Today is part 3 of a 7 part series. You can see the other parts of the series by clicking the links below. What’s one of your favorite tools for helping you manage your inbox? Leave a comment below and share!